Allow Locksmith Bee to install electronic deadbolt locks as a modern alternative on your property. Electronic deadbolt locks operate similarly to traditional locks minus a physical key. A Smart lock, like most traditional locks, needs two main parts to work. The lock and the key. In the case electronic locks, the key is not a physical key but a smartphone, mobile application, or a special key fob designated explicitly for this purpose which wirelessly will perform the authentication needed to automatically unlock the door. Smart Locks are also useful to allow users to grant access to a third party by the means of a virtual key when not in the area. Electronic deadbolt locks are the latest technology on the market and we offer multiple varieties to meet your individual needs. Keypad locks add an additional layer of security. If you are looking for something even more secure, biometric locks require a fingerprint scan to open the door, ensuring only authorized individuals have the ability to enter the premises. We can help you install a keyless entry system or even a bluetooth lock. 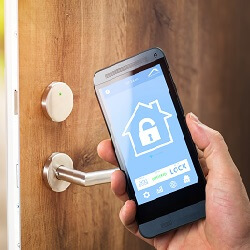 Bluetooth locks can be unlocked via your smartphone from anywhere, allowing you to open the door for guests when you are away without having to give away a set of keys.